Yaar bina chain kahaan re. Yaar bina chain kahaan re. Sona nahi, chandi nahi, yaar to mila. Arre pyaar kar le. Bappi da has enjoyed a much steeper climb than someone who would’ve been long the NIFTY during the past 10 years. 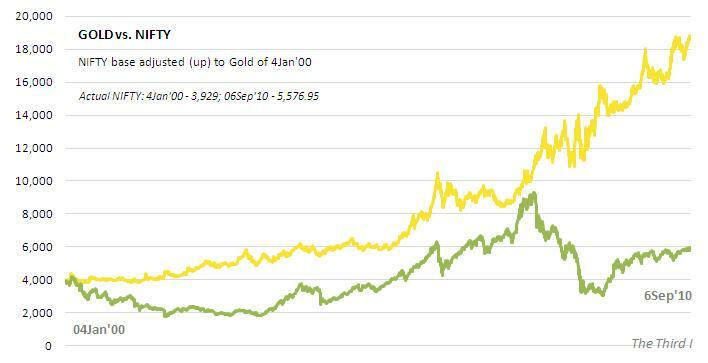 The graph alongside shows the relative performance of Gold vs. the NIFTY over the past 10 years or so. The price of 10 grams of Gold was around 4,000 rupees at the start of the millennium and it is close to 19,000 rupees now. In contrast, 4,000 ‘gold currenncy units’ invested in the representative sample of the Indian economy that is the NIFTY would have fetched you just 6,000 gcus today. I don’t mean XAU when I say gcu – the latter is just a hypothetical contruct to indicate what would happen if metal became our currency and not some signed bill of paper. At one point in time (7Jan’08) it looked as if equities would cross over and start performing better than Gold. That was not to be and the NIFTY turned south from that point in time with the relative performance gap widening from that point till today. I had purchased some Gold (coins) some 4 years back (partly by design since my equity holding had risen quite a bit) and thankfully I have not unwound that trade. Actually I have the tax laws to thank since long term capital gains set in for direct Gold investments only after a holding period of 3 years. I also took out the index data for the Dow & the NIFTY and restated the two data sets in equivalent gold weight in local currency terms. While the chart above puts out quite a glum picture for the NIFTY if seen through a golden lens, the Dow droop is even more depressing. What the chart alonside tells us is that if one would have done a 10 year swap between the index and gold, he would receive 79% less of gold (by weight) in the US as compared to a drop of 29% in India. 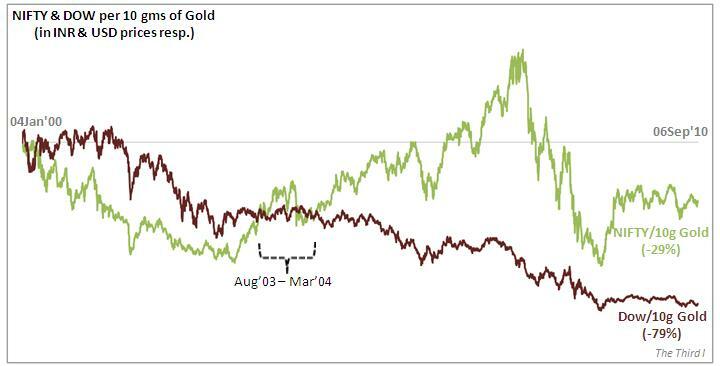 The inflection point for the NIFTY stated in gold occurred during the second half of 2003. Differential economic growths and currency movements took the lime green line far away only to come crashing down at the start of 2008. Indians are known to be voracious consumers of gold. Global gold analyts make it a point to understand a bit about the Indian marriage season and track it expectedly. I did spend a fleeting moment of sympathy on parents of girls of marriageable age. 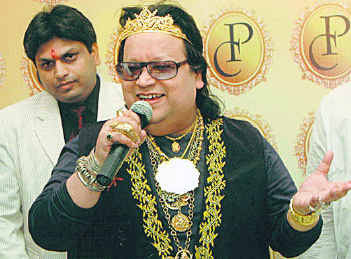 These guys must be getting squeezed tight unless of course, they had the foresight of Bappi da. While the assorted gaggle of relatives and opinion makers that mill around the circuses that are Indian marriages might have knowingly shifted their discussions to the value of the gold lining our marriages (as opposed to the weight), I have a suspicion that Indian mothers-in-law still regard their daughters-in-law by the weight of the gold that the latter brings into the coop. Any suggestions, on how I can get our mothers-in-law-in-waiting to read my site? Since it’s highly unlikely that you are a prospective mother-in-law, the question that may be on your mind would be: Wither gold? Well, I dont know! But I think that it will continue to climb for some more years to come. People have started looking at gold as an investment option now. The front covers of investment magazines have started displaying the golden glow quite frequently these days. I am sure you must have noticed an increase in the number of ads selling gold backed loans, etc. Since Indians have historically stuffed a lot of gold in bank lockers, under their mattresses, on their noses, etc, it’s a good opportunity for Indians to monetise it for income producing opportunities. I personally cannot relate to gold as an investment theme. While I have added some more gold (in ETF form now) after that past investment of mine, it is largely as a hedge. If you look at the first chart above, the metal (yellow line) has climbed almost on a linear basis. But the chart spans 10 years which is less than the time that I’ve been around investing in the markets. So my sense of patience is not adequate here. In any case, gold does not produce any income – there are no dividends to be had from gold. The utility and power of equity dividends itself is not understood by many, though I do feel that the attention to dividends would be more in the developed economies as compared to India since the yields are low. Perhaps an investigation into this might be a theme of a future post but here what I can say is that the moment the price of gold departs from it’s linear trend and starts to climb at a rate depending on the square of time, then it will be the best time to get out. Parabolas cannot sustain their weight. They need continuous energy to feed it and since equities cannot keep grovelling forever to droop below their book values, there will come a day when gold will sink down. 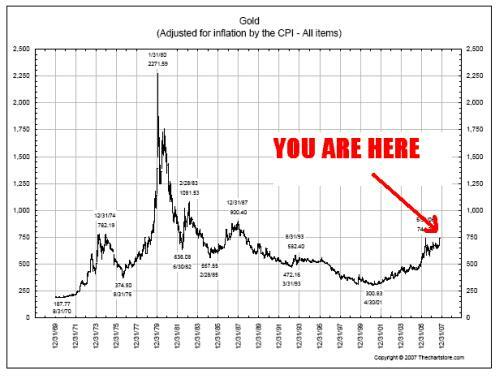 I don’t have the data set, but there are quite a few charts on the internet that depict the 200 year movement of gold (see above). And that will be the day when our statistically challenged mothers-in-law will be happier welcoming more heavily laden daughters-in-law into their fold. Till such time, enjoy the ride.